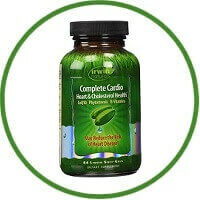 Irwin Naturals Complete Cardio Heart and Cholesterol Health Diet Supplement is the robust formula in conjunction with a healthy diet and exercise program can support heart function help maintain healthy cholesterol levels and protect the body from the oxidative effects of stress and aging. Many factors influence cardiovascular function and can create considerable challenges to maintaining optimal heart and blood vessel health. Powerful nutrients and botanical ingredients in this formula have been studied for their ability to promote healthy function of the heart muscle and vascular system. Antioxidants in this formula target free radicals in the vascular system while B-vitamins support healthy homocysteine levels. Consuming 1300 mg of plant sterol esters daily as part of a diet low in saturated fat and cholesterol can help to ma.